As much as I love cooking and baking, I don’t like when the recipes take too long to prepare or clean! I would rather go on a ski trip (sometimes we go skiing at night: just amazing) or play a board game with my family! That’s why I am always looking for quick, easy healthy recipes so I can get extra family time! Think it is difficult! Think again! Remember, cooking is about being creative! For today’s recipe I will be using Turkey! Turkey is low fat, affordable and most of all delicious! My kids can eat 3 Turkey slices in a row without any bread! I sometimes have to hide it in my secret compartment in the fridge! (you know that compartment of veggies where kids do not look because it is full of tomatoes, I hide it there). As a proud Butterball Ambassador, I will be featuring the Butterball Turkey Roast Smoked in a Turkey, Tomato & Cucumber Sandwich. Last time I used the Butterball Turkey breast in a delicious Turkey and Roasted Quesadillas. For those who do not know Butterball Canada, visit their website! They feature easy healthy recipes, product listing as well as top ten questions about Turkey: how to roast a turkey, how to handle it! Be sure to check it! This recipe is inspired from Butterball website! 2oz (57g) Sliced leftover Butterball turkey breast! 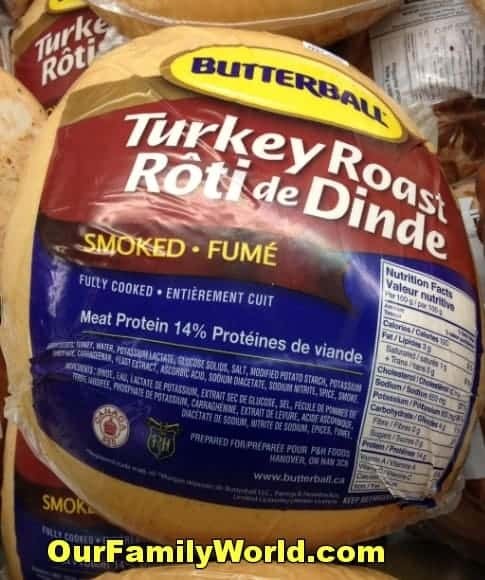 I went to my local butcher and I got this delicious Butterball smoked turkey roast! Mix mayonnaise (mustard in my case) and lemon juice. Spread on bread. Layer each bread slice with turkey, tomato and cucumber. Sprinkle with black pepper. Top with sprouts. Serve with fresh seasonal fruit. I served with baby carrots and blackberries. How easy is that! Eating healthy doesn’t have to be complicated or expensive! Just be creative and you will have easy healthy recipes ready in less then 30 minutes! I love butterball turkeys I don’t let my hubby pick up anything else when it is Thanksgiving, Christmas or Easter! Love the sprouts in the sandwich. This sandwich sounds amazing! I just picked up some turkey when I went shopping this week so I’ll have to try it out. We became vegetarians after my kids watched Food Inc. for a school project a few months back. Since then, I am constantly trying to replace our sandwich favorites with veggie versions. 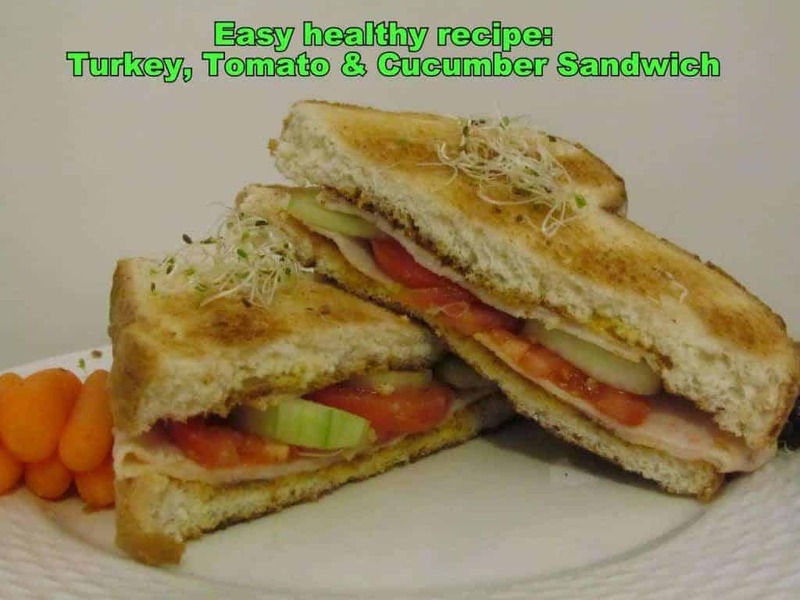 While your Turkey, Tomato, Cucumber Sandwich may have turkey in it.. it also looks like it would be fantastic forgoing the turkey! Thank you for the great inspiration. Thanks Victoria! You can also some red peppers and a hummus dip! It is delicious! That sandwich looks amazing! Its days like this that I miss eating bread! I’ll have to make this for DH! Now that looks like a great sandwich. I feel a craving coming on…. Thanks Tammy! It is SO delicious! Oh, This looks really great. 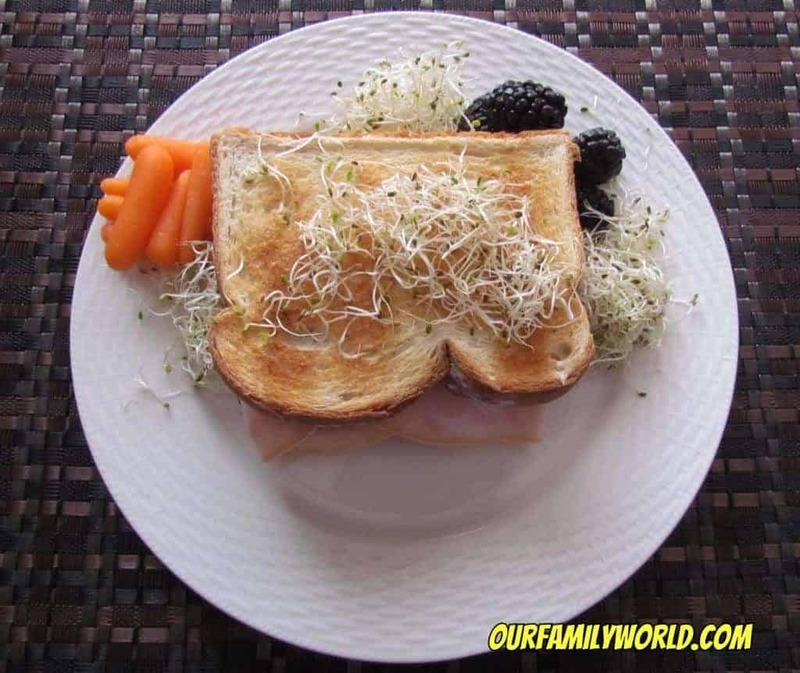 I love adding alfalfa sprouts to sandwiches. I love toasted sandwiches! Oh, this looks delicious. now I’m craving a sandwich. lol. Thanks Amber! I love toasted sandwich too!